This is a family of three tiered and stacked owls glazed in cranberry red. 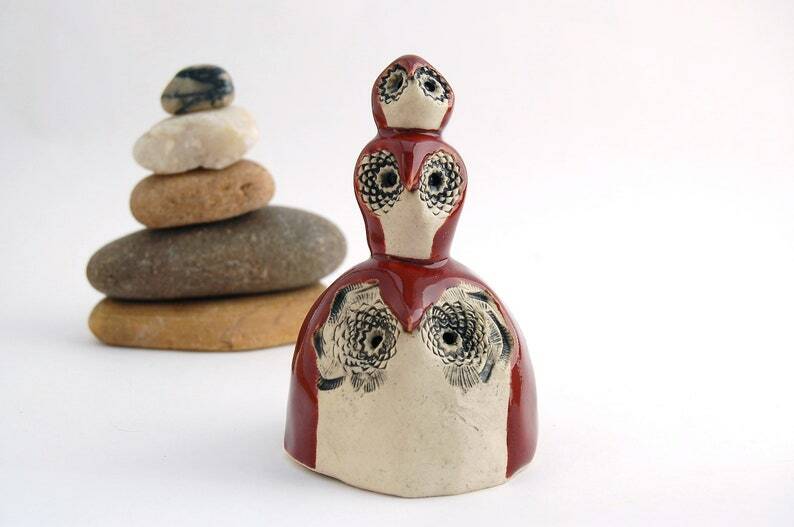 The base owl is a small pinch pot turned open side down and stamped with two large textured buttons. The center button was used for the eyes of each subsequent owl. 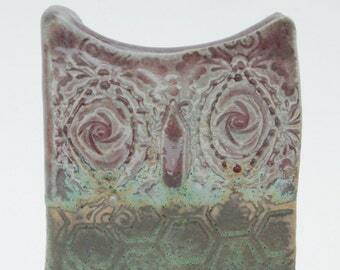 The whole piece was stained with black underglaze then wiped back to show texture then three coats of firebrick red was brushed on each owl, leaving a bare space that designates chest feathers. These three have a smooth glossy finish on their glazed parts and a subtle sheen around their eyes and chests. This special piece would delight any owl lover, mother of three (or mother of two, if you choose to count the base as mom), or even someone with a love of hiking. It will guide the recipient's way with beauty and a splash of whimsy. This tower of power measures 4 inches tall with an overall girth of 2.5 inches around at the base.